Winter sun breaks on the island of Tenerife are enjoyed by many people, especially those seeking an escape from the harsher winter weather of northern Europe. 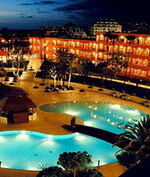 Faced with at least 4 months of short days, cold temperatures and potentially wet weather, the warm dry winter climate of the island of Tenerife is obviously very attractive to northern Europeans and can be reached using one of the many flights to the island provided by low cost airlines. Despite being part of Spain, Tenerife and the other Canary Islands are in fact closer to Africa than any part of Europe. The group of islands lie approximately 450 miles off the coast of Morocco and owes its climate to this location. If visiting the island here are few highlights that should make spending time on Tenerife all the more enjoyable. 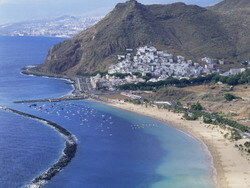 When ask you ask anyone about which is the best beach on Tenerife you will get a number of different answers. Because different people like different things the title of the best beach is a debated one. If your preference is for a popular, easily accessible, clean and well maintained sandy beach that satisfies the typical sunbather's dream, then the stretch of sand on the beautiful Las Vistas beach at Los Christianos will be your favourite. It can become busy during peak periods but is there is plenty of capacity and it is flanked by two other similar beaches, each in its own natural bay. A nice promenade along the Paseo Las Vistas provides a pleasant way to pass an evening, especially if there is a beautiful sunset. If your preference is for a remote, secluded beach and you don't mind the black volcanic sand that makes up many of Tenerife's beaches then the beach at El Bullullo on the north coast is both off the beaten track and beautiful, but can be hazardous for bathers if winds are strong. On the east coast of the island the beach at Playa de las Teresitas, although man-made is considered one of the most beautiful. It is 1.5 kilometers long and is an ideal beach for families as some shade is provided by palm trees. Remember that black sand is the natural sand of the island and any golden beaches will have been made from sand imported from the Sahara desert. Tenerife is also famous for it's volcano, the third largest in the world. Teide is fortunately an extinct volcano and is the highest mountain in Spanish Territory, reaching a height of 3717 meters. Despite its altitude, the mountain top is reachable by path for anyone used to some hill walking, although walkers will require one of the free permits otherwise their visit will be restricted to one of two viewpoints. For those unable to complete the walk a cable car also takes visitors to the height of the viewpoints. The area is a designated national park and there are some concerns about erosion damaging the summit code. Anyone wishing to visit the peak is advised to do so soon as it possible that the cable car will be closed down once its current license runs out. The walk to the summit is likely to take up to five hours and it is recommended that walkers set off before dawn to avoid the midday heat and possibly experience a dramatic sunrise. To experience the opulence of days gone by a visit to the town of La Orotava on the north-west coast of the island is advised. Situated in the valley of La Orotava, whose slopes are used to grow bananas, the town was where the noble and wealthy families chose to settle following the Spanish conquest. The architecture still boasts many fine examples of Renaissance mansions and beautiful churches. Visitors will also find exclusive shops and restaurants. The town is also famous for its wonderful gardens and for anyone visiting in early June the Feast of Corpus Christi sees the streets covered in carpets of flowers and the Town Hall providing the backdrop for an amazing flower tapestry. Tenerife is also popular as a winter training venue for top sportsmen and women, providing warm winter weather and good facilities. Those facilities have recently been enhanced by the opening in October 2008 of the T3 AthleticSphere, a venue costing 15 million euros. Swimming is the main focus of the centre with both a 50m pool and a 25m warm up pool available for use. The T3 also has the most advanced countercurrent swimming machine in the world, a fine gym, 2 football pitches, 3 tennis courts and 3 squash courts amongst its facilities. Accommodation is provided in luxury hotels in the nearby village of La Caleta. So you see, whether you want beaches, spectacular mountain scenery, picturesque villages or state-of-the-art sports training facilities, Tenerife has something for everyone. About the Author - If you found Dan Williams' information useful you can find out more about flights to Tenerife and other attractions on the island on the FlyThomasCook website. Among the Costa Adeje Gran Hotel's architectural highlights is a grand hall with a glass ceiling which is also the floor of the swimming pool above. Located 500 meters from the sandy beach, the hotel offers sweeping views of the ocean, mountains, and neighboring island of La Gomera. The mini spa offers a Turkish bath, sauna, steam room, therapeutic massages and body peels. Traditional Spanish tapas are served poolside. 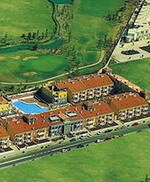 Families enjoy the supervised children's activities and children's pool, playground, and mini golf. Guests can visit the fitness center, play golf at one of five nearby courses, and dine on Mediterranean cuisine at the hotel's restaurant, also offering live entertainment. Modern guestrooms have tile floors, and balconies with views. The Dreamplace Hotel Gran Tacande is a colonial-style resort hotel built around volcanic stone columns and a fountain, 100 metres from Playa del Duque beach. Guests wishing to venture out of the hotel will find the Playa Fanabe beach one kilometre away and the Playa de Las Americas resort two kilometres away. 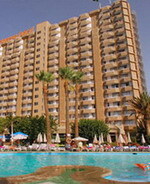 Relax beside the outdoor pool, with a separate pool for children, or take the short, 100 metre stroll to the beach. Guests are guaranteed a pampering in the Vitanova Spa and Thalassotherapy Wellness & Beauty Centre. The hotel offers a choice of dining options, including the Buffet Zurron restaurant, with indoor and outdoor seating, open for breakfast and dinner; the á la carte Bocana Grill restaurant, open for lunch, and Bocoy, a formal á la carte restaurant with impressive views of the ocean, fine cuisine and an extensive wine list. The H10 Costa Adeje Palace is a modern resort set in lush gardens, and located in Costa Adeje, overlooking La Enramada Beach, ten kilometres from San Miguel Castle. The H10 Costa Adeje Palace's main restaurant serves a buffet of regional and international cuisine in a bright informal setting with white tablecloths, while La Choza Restaurant is a grill and snack bar, set on a sun-drenched terrace beside the main swimming pool, where gourmet Spanish cuisine and an array of wines are served. Three freshwater pools (one heated) and one kid's pool are surrounded by lush gardens with streams and waterfalls, and entertainment includes animation programmes and evening shows, with a discotheque open till late, a games room and a mini-club for children. The Wellness Centre has a gymnasium, hot tub, indoor pool, sauna, Turkish Bath, massage treatment room and beauty salon. 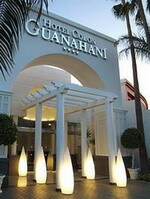 The Hotel Colon Guanahani is located in Costa Adeje, Tenerife, Spain. Siam Water Park is three kilometres away and the national park is 23 kilometres away. This modern hotel has outdoor heated outdoor swimming pools with a separate pool for children. There is a squash court and a beauty centre which provides treatments and massages. Hotel Colon Guanahani serves an international buffet in the main dining room. There is also a patio for outdoor dining. Bar Sala offers live music some nights and serves drinks. 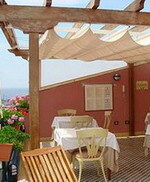 La Pergola is situated by the pool and offers light snacks and drinks. The hotel provides a complimentary breakfast buffet and room service during limited hours. The hotel offers half-board and full-board rates.The 154 guestrooms are air conditioned and have televisions with satellite channels. 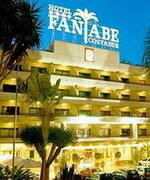 Situated in the Fanabé district of Costa Adeje, within 500 meters of the beach, the Fanabé Costa Sur is a modern five-story hotel one kilometer from the Acuapark. The circular main swimming pool has a children's area, and there are also two rooftop pools and a poolside snack bar. Guests can enjoy sports such as tennis, volleyball, minigolf and French boules, and relax afterward with a sauna or massage. Decorated in light neutral colors, the air-conditioned guestrooms have wood furnishings and furnished balconies. All have satellite TV, pay movies, minibars, safes, and direct-dial phones. Recreational options in the area range from whale-watching to scuba diving, and Mount Teide is 50 kilometers (32 miles) away.